Prokaryotic Cells are the most primitive kind of cells and lack few features as compared to the eukaryotic cell. Eukaryotic cells have evolved from prokaryotic cells only but contain different types of organelles like Endoplasmic reticulum, Golgi body, Mitochondria etc, which are specific in their functions. But features like growth, response, and most importantly giving birth to the young ones are the commonly shared by all living organisms. In the following content, we will discuss the general difference between the two types of cells. As these ‘cells’ are considered as the structural and functional unit of life, whether it’s a single cell organism like bacteria, protozoa, or multicellular organisms like plants and animals. Cell Wall Cell wall present, comprise of peptidoglycan or mucopeptide (polysaccharide). Usually cell wall absent, if present (plant cells and fungus), comprises of cellulose (polysaccharide). Presence of Nucleus Well-defined nucleus is absent, rather 'nucleoid' is present which is an open region containing DNA. A well-defined nucleus is present enclosed within nuclear memebrane. Shape of DNA Circular, double-stranded DNA. Linear, double-stranded DNA. Chloroplast (Absent) scattered in the cytoplasm. Present in plants, algae. Transcription and Translation Occurs together. Transcription occurs in nucleus and translation in cytosol. Organelles Organelles are not membrane bound, if present any. Organelles are membrane bound and are specific in function. Replication Single origin of replication. Multiple origins of replication. Number of Chromosomes Only one (not true called as a plasmid). More than one. Examples Archaea, Bacteria. Plants and Animals. Pro means ‘old,’ and karyon means ‘nucleus,’ So as the name suggest the history of the evolution of prokaryotic cells is at least 3.5 billion years old, but they are still important to us in many aspects like they are used in industries for fermentation (Lactobacillus, Streptococcus), for research work, etc. In comparison to eukaryotic cells, they lack few organelles and are not advanced as eukaryotes. Glycocalyx: This layer function as a receptor, the adhesive also provide protection to the cell wall. Nucleoid: It is the location of the genetic material (DNA), large DNA molecule is condensed into the small packet. Pilus: Hair like hollow attachment present on the surface of bacteria, and is used to transfers of DNA to other cells during cell-cell adhesion. Mesosomes: It is the extension of the cell membrane, unfolded into the cytoplasm their role is during the cellular respiration. Flagellum: Helps in movement, attached to the basal body of the cell. Cell Wall: It provides rigidity and support for the cell. Fimbriae: Helps in attachment to the surface and other bacteria while mating. These are small hair-like structure. Inclusion/Granules: It helps in storage of carbohydrates, glycogen, phosphate, fats in the form of particles which can be used when needed. Ribosomes: Tiny particles which help in protein synthesis. Cell membrane: Thin layer of protein and lipids, surrounds cytoplasm and regulate the flow of materials inside and outside the cells. Endospore: It helps cell in surviving during harsh conditions. In terms of peptidoglycan present in the cell wall, prokaryotes can be divided into Gram-positive and Gram -negative bacteria. The former contains a large amount of peptidoglycan in their cell wall while the latter have the thin layer. Eu means ‘new,’ and karyon means ‘nucleus,’ so these are the advanced type of cells found in plant, animals, and fungi. Eukaryotic cells have a well-defined nucleus and different organelles to perform different functions within the cell, though working is complex to understand. This kind of cells are found in algae, fungi, protozoa, plants, and animals and can be single-celled, colonial or multicellular. Among them, fungi and protists (algae and protozoa) are the major kingdoms. Nucleus: Eukaryotic cells have a well-defined nucleus where DNA (genetic material) is stored, it helps in the production of protein synthesis and ribosomes also.The chromosome is present inside the nucleus, which is surrounded by the nuclear envelope. It is a bi-lipid layer and controls the passage of ions and molecules. Mitochondria: It is called ‘the powerhouse of the cell,’ and is responsible for making ATP. Mitochondria has its own DNA and ribosomes. Chloroplast: These are found in algae and plants, it is one of the most important organelles in the plant which helps in converting energy sunlight into chemical energy through photosynthesis. They resemble mitochondria. Golgi Apparatus: It consists of a stack of many flattened, disc-shaped sacs known as cisternae. The exact nature of Golgi varies, but it helps in the packaging of materials and in secreting them. Lysosomes and Vacuoles – The most important function of Endoplasmic reticulum and Golgi apparatus is the synthesis of Lysosomes, which helps in digestion of intracellular molecules with the help of the enzyme called hydrolase. Vacuoles are the membrane-bound cavities containing fluid as well solid materials, and they engulf materials through endocytosis. Endoplasmic Reticulum: It transport lipids, proteins and other materials through the cell. They are of two types smooth endoplasmic reticulum and rough endoplasmic reticulum. Appendages: Cilia and Flagella are locomotory attachments, helps in the movement of a cell towards positive stimuli. Cilia are shorter than flagella and numerous. Surface structure: Glycocalyx is a kind of polysaccharide, and it is the outermost layer of the cell which helps in cell adherence, protection and in receiving signals from other cells. Cell Wall: Cell Wall provides shapes, rigidity, and support to the cell. Compositions of the cell wall may vary of different organisms but which can be of either cellulose, pectin, chitin or peptidoglycan. Cytoplasmic Membrane/Plasma Membrane: It is a thin semipermeable, surrounding the cytoplasm, it acts as the barrier of the cell which regulates entry and exit of the substances inside and outside the cell. This layer is made up of two layers of phospholipids embedded with proteins. In Plant cell, this layer is present below the cell wall whereas in the Animal cell it is the outermost layer. Ribosomes: Though small in size but are present in numbers, they help in protein synthesis. Eukaryotes have 80S ribosomes which are further divided into two subunits which are 40S and 60S (S stands for Sedverg unit). Cytoskeleton: It is supporting framework of the cells, which is of two types Microtubules and Microfilaments. Microtubules are the largest filament having the diameter of about 24 nanometers (nm), made up of a protein called tubulin. Microfilaments are the smallest filament of about 6nm, made of the protein called actin. Prokaryotic cells are the primitive kind of cell, whose size varies from 0.5-3µm, they are generally found in single cell organisms, while Eukaryotic cells are the modified cell structure containing different components in it, their size varies from 2-100µm, they are found in multicellular organisms. Organelles like mitochondria, ribosomes, golgi body, endoplasmic reticulum, cell wall, chloroplast, etc. are absent in prokaryotic cells, while these organelles are found in eukaryotic organisms. Though cell wall and chloroplast are not found in the animal cell, it is present in the green plant cell, few bacteria, and algae. 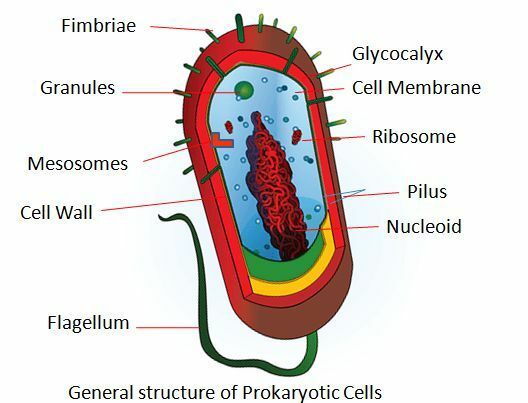 The main difference between Prokaryotic cells and the Eukaryotic cell is the nucleus, which is not well defined in prokaryotes whereas it is well structured, compartmentalized and functional in eukaryotes. Cell organelles are present which are membrane-bound and have individual functions in eukaryotic cells; many organelles are absent in prokaryotic cells. In prokaryotes, the cell division takes place through conjugation, transformation, transduction but in eukaryotes, it is through the process of cell division. The process of transcription and translation occurs together, and there is a single origin of replication in the prokaryotic cell. On the other hand, there are multiple origins of replication and transcription occurs in nucleus and translation in the cytosol. Genetic Material (DNA) is circular and double-stranded in Prokaryotes, but in Eukaryotes, it is linear and double-stranded. Prokaryotes reproduce asexually; commonly Prokaryotes have a sexual mode of reproduction. Prokaryotes are the simplest, smallest and most abundantly found cells on earth; Eukaryotes are larger and complex cells. The cell is the basic unit of life, responsible for all biological activities of the living being whether its prokaryote or eukaryote. Both of these cells vary in their role, like prokaryotes are the old type of cells hence they lack a proper nucleus and other organelles too, which are very well present in eukaryotes, as these are the evolved and advanced cells.